There are times when a hedgehog will shed large numbers of quills and replace shed ones with new ones. This process is called quilling. The quilling process is different than the replacement of spines that are lost individually. Quilling is a gradual and natural process that happens over time rather than an over-night occurrence. It can be better compared to teething in human babies. Quilling occurs over an extended period of time rather than shedding like a snake that typically occurs overnight or in a short period of time. Quills that are shed naturally have a root or bulb at the end (like human hair) but spines that are shed due to a skin condition or mites tend to have a flaky or soft tip on the end of the spine. The first major quilling or heaviest quilling occurrence is often distinguished by the loss of small fine quills and the growth of new quills. New quills can most easily be seen on a relaxed hedgehog looking down the spine and over the rump. They will be thicker new quills beginning to poke through the skin surface. New quill points will break through the skin fairly quickly after spines are lost so there are no bald spots or large areas of visible thinning in the hedgehog’s spine coat. Each hedgehog will experience quilling a little differently, in amount of aggravation, during the process and the time frame in which the quilling occurs. Understanding why new spines are growing helps in understanding hedgehog behavior. 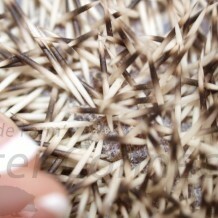 Replacement of quills due to natural loss of individual hairs. This quill loss is comparable to humans losing a hair or two and the replacement with new hair growth. The lost hair or spines can be seen but the replacement of the hair or spines is not noticeable. Replacement of lost adult quills due to mites, skins disorder, or recovery from physiological stress. Replacement of baby spines with adult spines. This type of quilling is typically more painful as larger quills are replacing smaller quills. Growth of new quills due to the hedgehog’s growth and size and therefore skin surface area. This is the most painful type of quilling. Some female hedgehogs will lose quills after weaning a litter. Seasonal shedding or quill loss is not typical with hedgehogs. There are a wide variety of thoughts and opinions as to the ages, stages, and length of time the quilling process takes place. The information here is generalities as to fit the description of most hedgehogs. Most hedgehog enthusiasts will agree that the first stage of quilling occurs at 2-3 weeks and will last up through the first twelve weeks of life. The process will slow after the first 12 weeks but will continue off and on for the first six months. Quilling typically occurs first at around six to eight weeks of age and again at around four months during adolescence but it may also occur several other times during the hedgehog’s life. Some stages may last only four to five days whereas other stages for different animals might last 2-3 weeks. Some hedgehogs will go through another round of quilling at one year of age that is generally much less traumatic than the initial quilling. It is very normal for hedgehogs to become significantly grumpier during the quilling process. Extra patience and gentle handling is required of us. You may notice that your hedgehog eats less, which is caused by their discomfort level. Offer treats and favorite foods to help increase your hedgehog’s appetite. Malformed quills are fairly uncommon especially considering there are thousands of quills on each hedgehog. A malformed quill may look like two quills had grown in together and fused. The quill can be pink, angry looking and almost fleshy at the base of the quill/s with red and irritated skin at the base of the quill. A gentle tug with some tweezers to may remove the quill and if it isn’t removed easily the hedgehog needs to see the vet to have it looked at. Your veterinarian will extract the quill with tweezers which may require some effort while the hedgehog is awake. Your veterinarian is likely to opt to have the quill removed while the hedgehog is under anesthesia. There was a little tiny bit of blood and your hedgehog is likely not going to be happy with the process. Hedgehogs generally show an improved demeanor within the first 24 hours. Veterinarians are likely to prescribe an antifungal/antibacterial ointment to place on the wound with long q-tips. Malformed quills may or may not test positive for fungal or bacterial infection. Some hedgehogs show no discomfort during quilling while others might become very grouchy or seem anti-social. Hedgehogs that are uncomfortable might huff and puff more, relax less and are in general very grouchy. Change in behavior is perfectly normal and should be understandably expected considering the potential discomfort of the quilling process. Some think of quilling as a combination of teething and razor burn because there are many irritated hair follicles and muscles all over the hedgehog’s body. In addition, hedgehogs will be hitting their version of puberty at about the same time! Remember to pickup your hedgehog fairly quickly to ease the pressure of your hands on its spines. Using gloves, oven mitts or even pot holders to scoop up your hedgie will help you be more comfortable picking up the ball of prickles. Instead of attempting to “pet” your hedgehog simply hold it or allow it to crawl over you and explore. “Petting” may actually increase the discomfort and therefore increase your hedgehog’s grouchiness. You don’t want to avoid handling your pet during the quilling process but you certainly don’t want to increase their agitation by petting them if their behavior indicates they are uncomfortable. Some hedgehogs may become nippy due to their discomfort. Continue to hold them on your flat hands, allow them to walk around on a lap mat, or cuddle them tucked in a shirt or hoodie pocket and you can continue with the bonding process even if they are more antisocial than normal. Some hedgehogs will have a harder time bonding if left alone during the bonding process. Don’t worry though, with consistent and considerate handling the grouchiness will get better and some seem to bounce back to their happy selves once the quilling process is over. We suggest an oatmeal bath using a homemade oatmeal soak or other organic oatmeal based soaps found at any Health Food Store. Something to keep in mind is that chemicals or preservatives can dry out the skin so even though something might seem helpful it might actually intensify the problem. A tablespoon of olive oil or other non-toxic, non-flavored edible oil or Vitamin E to the final rinse of a bath might also be helpful. Do not rinse the oatmeal bath or the oils from the skin so they have a chance to penetrate the skin. Be sure to dry the hedgehogs thoroughly and keep out of drafts after a bath. Too frequent bathing can cause additional dryness but twice per week should be adequate during the roughest part of the quilling process. A couple small drops of olive oil directly on the skin (not spines) will help to soften the skin and make the process a little easier. One must be careful not to put too much oil on the skin because excess oil can cause problems as well. Another excellent oil to help moisturize and soothe the skin is NIKS oil available through Millermeade Farms. It has all organic ingredients including olive oil, calendula oil, apricot kernel, pumpkin seed oil, aloe vera, vitamin E, rosemary and lavender essential oils. All ingredients are natural and healing to the skin. More bathing tips, suggestions, and instructions can be found in our Bathing guide. Our Dry Skin article had quite a few tips and suggestions of things you can add to the diet to help the quilling process. A few additional reminders are to try and avoid causing your hedgehog to ball up and huff as that is causing it to stretch already sore and irritated muscles. Also, do not force the hedgehog on its back as that will likely cause additional discomfort. A veterinarian should address quill loss other than what is associated with the natural shedding process including such things as insufficient diet, stress, and hormonal imbalances. Mites are the most common cause of quill loss other than the quilling process. Quill loss as a result of mites can be any size quill and new quills will not be growing in. A good indication that another problem exists is bald spots. Bald spots are not associated with the normal quilling process. Refer to our Mites & Other Ectoparasites article for more information on this topic. First, look at the end of the quill where it attaches to the skin. A healthy quill will have a clear root bulb and a damaged quill will be soft and “mushy” at the same end. You can check for mites at home, but keep in mind that this is not a foolproof method but only a first step in mite discovery. Your hedgehog is likely shedding many white flakes. Collect those white flakes on a solid black surface such as a piece of black construction paper. Use a stiff toothbrush or another small blunt object to scrape at the skin. The end of a fingernail file, the backside of a knife or a small spoon will work well. Take a magnifying glass and look at the flakes under bright light. Crawling or moving flakes are a sure sign of mites. Contributor: Laurel Land and her experience with Bamboo and a malformed quill.